Front row from left are Gallia Academy FFA students receiving their state degrees: Jamie Steger, Katie Carpenter, Abby Cremeans, and Derek Henry. Back row from left: Ethan Mays, Cody Brumfield, and Clay Montgomery. 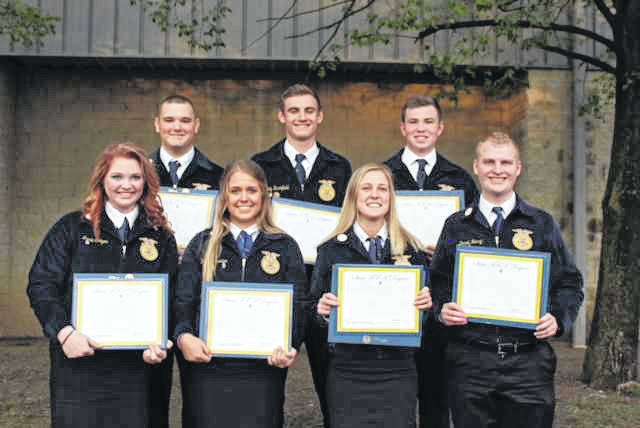 GALLIPOLIS — Seven Gallia Academy High School students received the State FFA Degree during the fifth session of the 90th Ohio FFA convention held in Columbus. This year’s State Degree recipients are Cody Brumfield, Katie Carpenter, Abigail McKean Cremeans, Derek Henry, Ethan Mays, Clay Montgomery, and Jamie Steger. To earn a state degree through FFA students must be active chapter members for two years, receive two years of systematic agricultural education, earn $1,000 or work 300 hours in addition to class time, demonstrate leadership abilities, as well as record and report on all of this and more in order to be eligible for the state degree. Cody Brumfield, a junior, is a three year member in the Gallipolis FFA chapter. His FFA activities include state livestock, state finals livestock, national livestock, district urban soils, state urban soils, national urban soils, state dairy, state dairy finals, cooperatives online exam, leadership night, Cattlemen’s banquet setup and cleanup, and Farm Bureau banquet setup and cleanup. He served as the chapter treasurer 2017-2018 and was elected to the office again for the 2018-2019 school year. His supervised agricultural experiences include showing and selling market steers at the Gallia County Jr. Fair, landscaping, and farm care. Cody plans to graduate from Gallia Academy High School in 2019 and attend The Ohio State Agricultural Technical Institute and major in Animal Sciences with a beef specialization. Katie Carpenter, a junior, is a third year member in the FFA where she participates in activities such as: District Parliamentary Procedure, State Livestock Judging, State Finals Dairy Judging, District Food Science, District Rural Soil Judging, State Convention, National Convention, Veterinary Science, State Leadership Night, County Ag Day, and Adopt-A-Highway. She also served as the Student Adviser on the officer team for the 2017-2018 school year and will be serving as the Secretary in the upcoming year. Her Supervised Agricultural Experiences include her market sheep and market goats. She plans to graduate from Gallia Academy High School in 2019 and majoring in Graphic Design. Abigail Cremeans, a junior, is a third year member of the Gallipolis FFA Chapter. She is the current Sentinel and will be serving as the Vice-President in the upcoming year. Her FFA activities include the following: Rural Soil Judging, Food Science, Dairy Judging, Livestock Judging, Parliamentary Procedure, Veterinary Science, Farm Business Management, State and National Convention, Adopt-A-Highway, Red Cross Blood Drive and Ag Day. Her Supervised Agricultural Experience includes her market sheep and market goats. She plans to graduate from GAHS in 2019 and to attend college at Marshall University. Derek Henry, a junior, is a third year member in FFA. His FFA activities are State and National Convention, Urban Soil Judging, State Livestock Judging, Cooperatives Online Exam, Farm Business Management, Adopt-A-Highway, and Gallia County 4th Grade Ag Day. His Supervised Agricultural Experience includes his market hogs for the 2016-2018 fairs, Landscaping from 2017-2018, and running his own candy business in the winter months. He plans to graduate from Gallia Academy High School in 2019 and attend Ohio State University & receive a Bachelor’s Degree in AgriScience Education. Ethan Mays, a senior, has been an active member in the FFA for two years. His FFA activities include State and National Convention, Red Cross Blood Drive, State Leadership Night, Urban Soils, State and District Forestry, State Wildlife, Farm Business Management, Cooperatives Online Exam, and Gallia County Fourth Grade Ag Day. His supervised agricultural experience includes farm labor at Four Seasons Veterinary Clinic where he has worked for approximately a year. He plans to attend Rio Grande University in the fall and major in Wildlife Conservation. Clay Montgomery is a two year member of the Gallipolis FFA chapter. He is the current chapter Vice-President, and will be serving as the Chapter president in the upcoming year. His FFA activities include the following: Advanced parliamentary procedures, Urban soils at the district, state and national levels, advanced creed speaking, extemporaneous speaking, job interview, livestock evaluation, dairy evaluation, farm business management online exam, and greenhand online exam. His current supervised agricultural experience projects are a placement SAE working for Dr. Daniel Black and two entrepreneurial beef feeder calf and market lamb SAE projects. He plans to attend college after graduating from Gallia Academy and majoring in Civil Engineering. Jamie Steger, a junior, is a three year member of the Gallipolis FFA chapter. Jamie will be serving on the officer team as the Student Adviser in the 2018-2019 school year. Her FFA activities include food science, FFA Camp, National Convention, and State Convention. Her supervised agricultural experiences include working with her market goats and market sheep. She plans to attend college after graduating from Gallia Academy in 2019. An article on River Valley High School students earning State FFA degrees will be forthcoming in a future edition of the Tribune.